Nature-Throid is a hypoallergenic combination thyroxine (T4) and triiodothyronine (T3) hormone replacement drug made from Thyroid USP. Nature-Throid has been used for decades, and is one of the safest drugs available. It is formulated using hypoallergenic inactive ingredients and does not contain any artificial colors or flavors, corn, peanut, rice, gluten, soy, yeast, egg or fish / shellfish. for PATIENTS ONLY - requires a prescription by Dr. Adrian. Learn How to Become a Patient today. For Patients Only. Learn How to Become a Patient today. Patients are required by law to follow up for an appointment every 12 months or as directed by your doctor. Nature-Throid contains both thyroxine (T4) and triiodothyronine (T3) hormones, which simulate your body's natural processes. In contrast, synthetic hypothyroidism medications consist of either T4 or T3 hormones, but not both. The concept behind the use of T4 hormone replacement alone is that synthetic T4 will be converted into T3. A major flaw with this concept is that the conversion from T4 to T3 may not happen, or may only happen at a diminished rate. Therefore, a hypothyroid person would not receive benefits from T4 hormone replacement alone as they may still be deficient in T3. In reality, many patients do not start to feel relief from their symptoms until they switch from synthetic to Nature-Throid. Evidence is presented that many people have hypothyroidism undetected by conventional laboratory thyroid-function tests, and cases are reported to support the empirical use of Armour thyroid. Clinical evaluation can identify individuals with sub-laboratory hypothyroidism who are likely to benefit from thyroid-replacement therapy. In a significant proportion of cases, treatment with thyroid hormone has resulted in marked improvement in chronic symptoms that had failed to respond to a wide array of conventional and alternative treatments. In some cases, treatment with desiccated thyroid has produced better clinical results than levothyroxine. Research supporting the existence of sub-laboratory hypothyroidism is reviewed, and the author's clinical approach to the diagnosis and treatment of this condition is described. Altern Med Rev. 2004 Jun;9(2):157-79. Nature-Throid can be obtained through your physician or by a prescription. Follow dosage directions from your doctor. 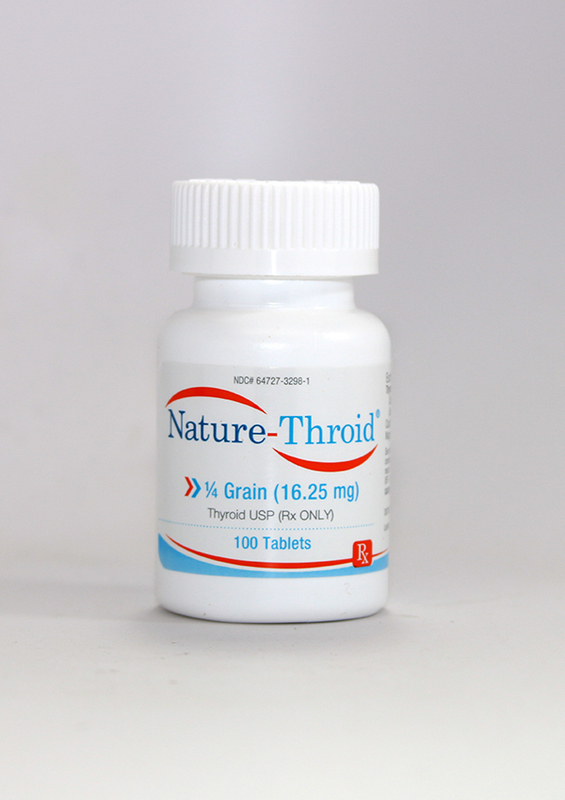 Nature-Throid is a hypoallergenic combination thyroxine (T4) and triiodothyronine (T3) hormone replacement drug made from Thyroid USP. Tell your doctor immediately if any of these signs of too much thyroid hormone occur: diarrhea, headache, heat intolerance, irritability, menstrual changes, nervousness, trouble sleeping, heavy sweating, unusual weight loss. Tell your doctor immediately if any of these rare but very serious side effects occur: irregular/pounding heartbeat, trouble breathing with exercise, swelling of the arms/legs, extreme weakness. Seek immediate medical attention if any of these rare but very serious side effects occur: chest/jaw/left arm pain.A very serious allergic reaction to this drug is unlikely, but seek immediate medical attention if it occurs. Symptoms of a serious allergic reaction may include: rash, itching/swelling (especially of the face/tongue/throat), severe dizziness, trouble breathing. This is not a complete list of possible side effects. Thyroid hormone should not be used either alone or in combination with diet pills to treat obesity/cause weight loss in patients with normal thyroid production. If used in combination with diet pills (appetite-suppressant drugs), serious, even life-threatening effects could occur. As with any prescription medication, talk to your doctor about any existing medical conditions, and let your doctor know immediately if you experience any side effects. You have any food or medicine allergies. You’re pregnant, trying to conceive, or breastfeeding. You are taking any other prescription or over-the-counter medications, or if you start or stop any medications while on WP Thyroid® and Nature-Throid®. You suffer from any medical conditions other than hypothyroidism, particularly heart disease, clotting disorders, or adrenal or pituitary gland problems. You have diabetes. Monitor your blood and/or urinary glucose levels as directed by your doctor and immediately report any changes. You’re taking anticoagulants (blood thinners). Let your dentist know you are taking WP Thyroid® and Nature-Throid® before any surgery. You experience any of the following symptoms: rapid or irregular heartbeat, chest pain, shortness of breath, leg cramps, headache, nervousness, irritability, sleeplessness, tremors, change in appetite, weight gain or loss, vomiting, diarrhea, excessive sweating, heat intolerance, fever, changes in menstrual periods, hives, skin rash or any other unusual medical event. Do not take WP Thyroid® and Nature-Throid® either alone or in combination with other medicines, for the treatment of obesity or weight loss. In patients with normal thyroid levels, doses of WP Thyroid® and Nature-Throid® within the typical range used for hormone replacement are not effective for weight loss. Larger doses may result in serious or even life-threatening effects, especially when used in combination with certain other drugs used to reduce appetite. Do not take WP Thyroid® and Nature-Throid® for male or female infertility unless it is associated with hypothyroidism. Do not take WP Thyroid® and Nature-Throid® if you have hyperthyroidism or are allergic to any of its ingredients. Use WP Thyroid® and Nature-Throid® exactly as prescribed. Unless otherwise directed by your doctor, do not stop taking either medication or alter how often it’s taken. Many factors can contribute to the length of time symptoms are alleviated, though generally people feel an improvement within a few weeks. For some, though, improvement in symptoms may take up to three months. Your doctor will determine which dose is right for you. If any life changes or new symptoms occur, consult your doctor to adjust your dose. Continue to see your doctor until your dosage levels prove stable based on your lab work, then continue to see your doctor at their request. Thyroid replacement therapy is usually taken for life.